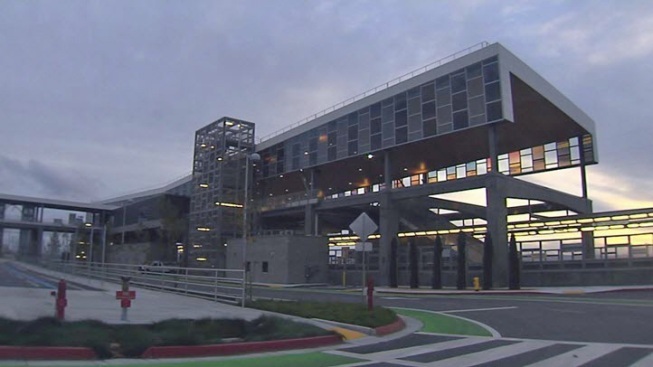 Software troubles could mean BART’s $900 million Warm Springs extension in Fremont will not be up and running until spring, officials acknowledge. The station, with its distinctive glass roofed rotunda, has been finished for months. Its tracks and tunnels are done and there are 2,000 empty spaces in the station's parking lot. In preparation for opening, BART created a sweeping aerial video of the $900 million station as viewed from the fields near the Tesla auto plant in South Fremont. The one thing missing is passengers, and the transit hub is likely to remain empty until at least March. The 5.4 mile project has been dogged by delays. BART had trouble getting money to finish tunneling under a major park and lake in Fremont. Then, last year, another hiccup. “We were in testing phase and all of sudden the electric power that serves the third rail burned up,” recalled Tom Blalock, who serves on BART’S governing board for Fremont. Still, the project was back on track as of last September when another problem surfaced. This time, there was trouble getting the new train control software to link up with BART’S main train control network. “It’s a myriad of issues, it’s not one thing and another thing– it’s software,” said Molly MacArthur, spokeswoman for the Warm Springs project. She likened the challenge to linking an early generation cell phone to a current generation smart phone technology. “It’s really complicated in hooking the two together,” she said. The problem was particularly frustrating since the contractor who created the new software had already assured BART that the system would work when the failures started to occur. “They did certify the program – but that said, we have a role to play in certification too,” MacArthur said. The problem was that the new system misreported vital data recorded in virtual testing, including something critical: the true speed of a train crossing a key junction. The contractor assures BART the problem is fixed. But BART is now running nine weeks of tests to make sure. Even after the problem is resolved, BART plans at least a month of testing on the system using real train cars. Also, state regulators have to weigh in and give approval. Impatient riders regularly press Blalock for a date. “When’s Warm Springs going to open?” Blalock said he was just asked while riding BART last week. He says he has to tell people that he simply doesn’t know.